Adobe did a very good job with Flex and they are far ahead of their rivals in RIA area. Meanwhile google is doing great with several java projects (such as guice, gwt) and bringing Java support to Google App Engine. Actually Google even has an open source Flex components library called flexLib. 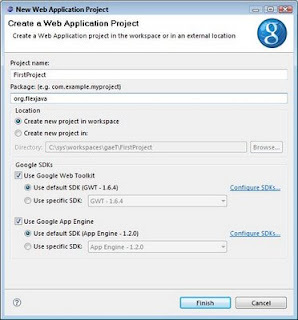 Java on Google App Engine is a very important step. Since I graduaded i hear most of friends bringing up ideas but not trying to built them, mostly because of the costs of Java hosting. Java is a elegant and sophisticated platform which is very fun to work on but never offers cheap and easy hosting alternatives like PHP. Google App Engine can finally change this, it offers zero cost startup, flexible payment options as your project grows and also provides a very easy development environment. 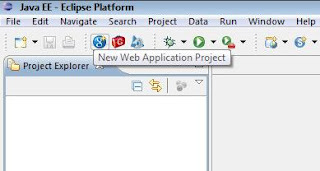 All you need is just to install the eclipse plugin and start coding. Even when a new GAE project is created, a basic GWT example is already included. I really like the scene Obi-wan Kenobi meets Anakin Skywalker in Episode I. Qui-Gon introduces Anakin and says “Anakin Skywalker meet Obi-Wan Kenobi”. It is an important scene bringing two different people together for a very long time. This post will be an intoduction of Flex to Google App Engine. Two great but totally different worlds. We will build a very basic servlet to feed data to our Flex application, and use Google's datastore to easily persist the data. 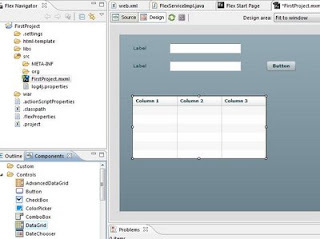 Before starting the tutorial I assume GAE plugin and Flex builder plugin is already installed to your Eclipse instance. You must have noticed the new three buttons on toolbar. Just click the “New Web Application Project”. Next give a package and project name. You must have noticed the wizard already added GreetingService, GreetingServiceImpl and a GWT class with the name of your project (in this case “FirstProject”). This is a good start specially for starting GWT but not usefull for us. Just leave them there and open web.xml file under war/WEB-INF and add a servlet description. We are ready to create a servlet to feed our Flex Client. 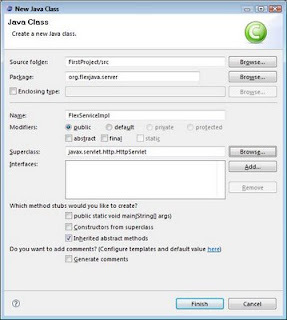 Right click org.flexjava.server package and add a new class file extending HttpServlet as shown below. Now its time to design our backend service. I don't really like hello world projects so even if we are coding a basic project lets find a real (but still basic) phonebook project worth to code. For the basic functionality we need retrieve the list of the contacts stored in the datastore and we also need to add new ones. We need an Entity for our contacts. Lets create a new Class named Entry and add the annotations to make our Entry class persistamce capable. GAE's datastore is quite easy to use. Just create a persistanceManager and use makePersistant or newQuery methods to save or retrieve data. 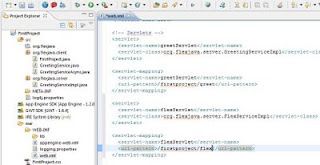 Lets start coding our servlet using those. Our GAE code is ready, now we can move on to Flex. 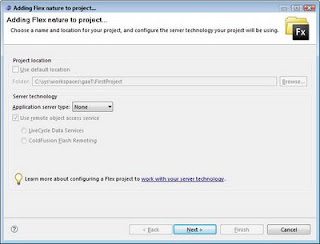 To enable our project Flex compatible, right click project and select add Flex Project Nature. 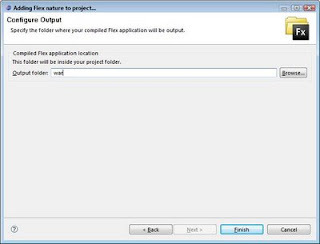 Select war folder as the output folder so the build files will be deployed to server. Since we just added Flex nature and created a mxml file, Flex Builder finds it confusint to prepare the html wrapper files for the swf build. 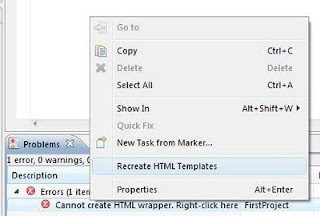 To make Flex builder's life easier go to errors tab, right click the error and select recreate HTML Templated. If there are no errors just skip this and continue. Now we are free to design our own user interface. 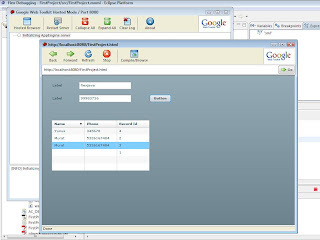 Switch to design view drag and drop 2 labels, 2 text boxes, a button and a datagrid component. Now we can switch to source mode to code. We are going to use very little coding, most of the work will be done by auto XML parsing and binding the data between components and variables. So little and our client is ready, right click the project and select run as Web Application. GAE Plugin adds an embedded datastore and a server to your project to test. Whenever you click run the embedded services will be running and even an internal browser will run your client. 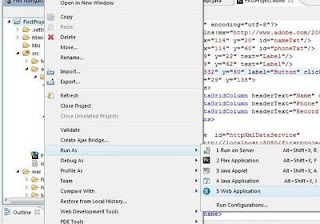 Since our project name and mxml file has the same name, the default page on web.xml file point to our Flex application. Please dont forget to modify in your web.xml file if yours differ. p.s. While waiting, start coding your dreams for free and keep in mind if you are interested in depth details of Flex, eteration offers a new training course which i also act part in the preperation. Hi Murat, since I had lots of work, I was not able to find time to search about this topic.